Go VOTE for 'People's Choice Award', enter your ballot at the customer service desk for #3 Venus Flytrap by Jeannette Brossart and Glenn Walters!!! You may recognize this. When I was in Italy, I created a small Venus Flytrap sculpture with the intent of it serving as a model for a larger version. This is the larger version, installed today at the University Mall in Chapel Hill for the 4th Scrapel Hill Exhibit. A show of artworks made from repurposed, recycled, and scrap materials. Each half of the "trap" is 2 ft wide plus the additional length of the wine bottle "teeth". 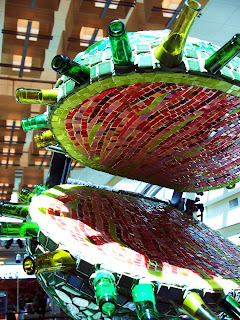 They are made from waste polystyrene, cement and fiberglass layers, then applied scrap and recycled glass mosaic. The support structure mimics the plant structure with a large broad leaf (made from garage rails and patio umbrella supports). There are some "swampy" details such as flowers and a snail. It does actually move, thanks to my collaborating friend and co-designer/fabricator, Glenn Walters, and his assistant, DJ Fedor. It works on "people power" and a repurposed air compressor system. 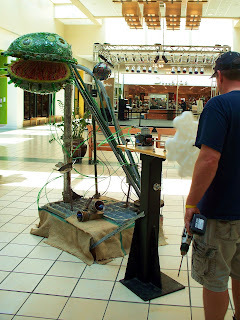 When you spin the flower wheel, air pumps through the green tubing to a piston mechanism. When enough air is is the system, the piston activates, opening and closing the top half of the "trap" about 30 degrees. 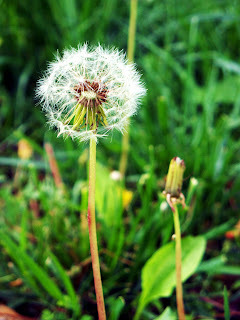 Just enough to catch a pesky insect. It will be on exhibit for a couple of months, then looking for a permanent home.... or swamp. My first memory of formal art is at the Gainesville (Florida) Museum of Art. Our family would go there on Sundays for something free and educational. 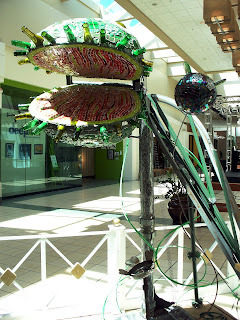 We went several times, but my brothers and I were always more excited to see the alligator pit on the grounds, than step foot into the museum to see the art. One trip, my Dad just took me inside while Mom and brothers were waiting at the alligator pit. My first impression was that the exhibit was just a bunch of boring line drawings... He said, "no, look closer". So I did. And to my amazement I saw little men walking up and down endless staircases, birds that turned into lizards, and a dizzying assortment of optical illusions. It was an exhibit of MC Escher. Dad is a bit artistic himself, he liked to draw and sketch, woodcarving during our teenage years, and now in retirement years, painting. He is also my favorite assistant. He is helpful with ideas and structural considerations. He is strong and able to help lift some of my sculptures for installations. He cuts wood panels for me and other related tasks. He has a truck and is willing to volunteer when I need him. He is proud of me. His favorite flower is a dandelion.